On 30 November 1948, a middle aged stranger arrived in Adelaide, presumably on a train from Melbourne. After tidying himself he purchased a one way ticket to the suburb of Henley Beach and deposited his suitcase in the Cloak room of the Railway station. Walking across the street he got onto a bus and paid for a ticket to the beach suburb of Glenelg. Later that evening a well dressed man was seen lying on Somerton Beach with his head against the seawall. On the following morning the body of a male person was found dead in the same position. He had no identification and the tags had been removed from his clothing. The unused ticket to Henley Beach and the validated bus ticket were located in his clothing. An autopsy revealed evidence that he may have died from an unidentified poison. An unclaimed suitcase was later found in the Cloak room of the Railway Station. It was forensically linked to the deceased even though no identification was located. The tags had been removed from the items in the case except for three pieces of clothing. These had the names Kean, Keane and T Keane written on them. Despite many viewings, extensive publicity and national and international investigations he was not identified. He was preserved in formalin and a cast was made of his bust for future identifications. 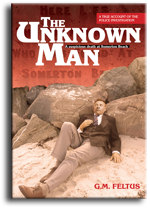 He was eventually buried as 'The Unknown Man'. At a future inquest a small, tightly rolled piece of torn paper containing the words Tamam Shud was found in the fob pocket of the trousers worn at the time of his death. These words were identified to a copy of the Rubaiyat. Extensive media coverage caused the production of the actual book which had been thrown into an unlocked vehicle at Glenelg. Written on the back of the book police found five lines of letters, and a telephone number that was traced to the home of a nurse who had recently moved to South Australia, and was living in close proximity to where the body and book was located. The media coined the phrase 'code' in respect to the letters and hence the spy theory came to the fore, as did the large numbers of would be code breakers. The code has not been cracked. Was he a spy? The nurse was interviewed and she said that when she was nursing in Sydney during the war, she gave a copy of the Rubaiyat to an Army Lieutenant she met at the Clifton Gardens Hotel. Police identified the lieutenant and went to his home expecting to learn that he was missing, and that he was possibly the unidentified man. To their dismay he not only presented himself but also produced his copy of the Rubaiyat that had been inscribed by the nurse. Who placed the telephone number of the nurse on the book found at Glenelg? The story finishes with a final twist. Also included in the book are a number of appendices that provide additional information on relevant subjects. Enjoy your read and maybe, just maybe you may be able to put it all together.